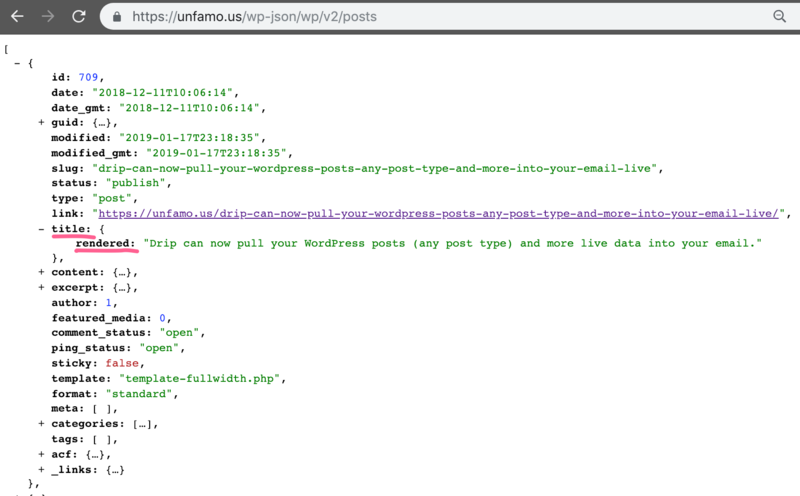 Drip can now pull WordPress posts (from any post type) and more into your emails - Drip just got a lot more powerful. Drip just got a lot more powerful. In addition to several platform-wide enhancements lately, Drip quietly introduced Custom Dynamic Content – this is the latest feature that has Drip developers very excited. A topic like this deserves a really good post, however my two year old is moments away from waking and I really want to get this post out. I did want to do a post on this a few months ago when it was first released, but this feature is only available via support and I felt a bit bad about sending them more work 😆. 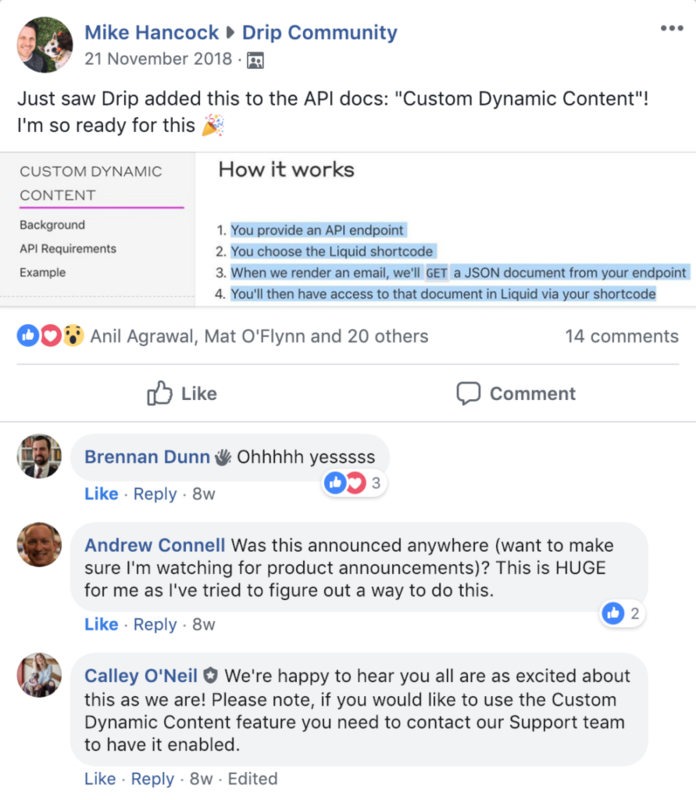 So when I asked Steve Brian (Drip’s CTO) if dynamic custom content would be something we can setup ourselves from the app without supports help, he said “bring it on support and don’t feel bad”. So once you finish this post, get a C.D.C. request in to Drip support! I recommend you check out the Drip API docs before getting started, you will see that the “Custom” in “Custom Dynamic Content” means that you can send parameters to your API endpoint and get certain data from your API. I’ll get back to doing that type of thing in another post, but for now let’s just look at how to handle top-level arrays and get post data. Pop in your own domain at the start of that URL and load it up in a browser. With WP, max posts per page (I think) is 100 posts. If you do more than the standard 10 posts, you run the risk of going over the 350kb document limit (which is set by Drip) and I’m not sure what happens when you do that 😆. So maybe just stick with the first option (10 posts) if you can, unless your posts are very small. Now you have the Liquid shortcode setup – you can access your blog posts with Liquid! – but how? So what is happening here? I’m assigning the post variable to the latest post in the feed. references the first post object in the feed. On the next line I call the assigned post, “.title” references the title object inside of the post object, and “.rendered” references the rendered key inside of the Title object. So now you have rendered the most recent blog post title. Want a list of your latest 3 posts? You can do that with Liquid Iteration, see here in the Liquid docs for all of the iteration options. Want more? Do you use Advanced custom fields? So that I can add an email only image to my blog posts, I’ve used ACF to create a field for my blog posts called “email_image_for_post”. By default ACF would add nothing to the JSON output, so now you will need to install a plugin called ACF to REST API. Now you can access that field as a key in the the ACF array under the post object. So now you can get custom fields from custom post types and pull that live data into Drip 🤯- this opens up a huge can of worms. Hopefully you found this post useful – I have so much more to share with Custom Dynamic Content. Next I’ll probably do a post on WooCommerce products, getting your top products etc, but I have to get going now so I’ll stop here. I have been working on a WooCommerce + Drip plugin called McDrippin. It works with Drip’s Order API + tags & events. I plan on making a free version and an extras version (which helps you create amazing Abandoned cart emails). I’m still testing it all out and hope to have it out in the next few days. 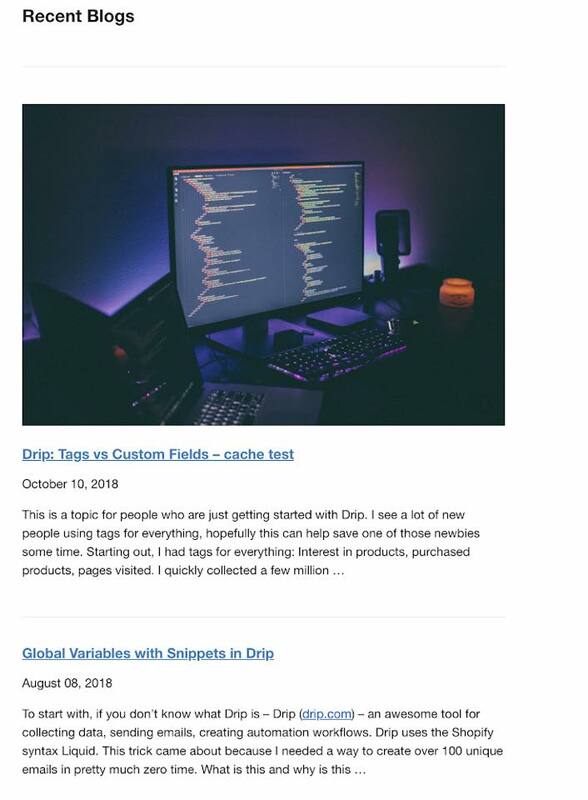 If you would like to find out when it’s released or want to see more Drip development blog posts, please join my mailing list. Feed WooCommerce product data right into your marketing emails. When CDC changes from “Center for Disease Control” to “Custom Dynamic Content” you know this stuff is powerful. Really enjoying your skills, Mike!